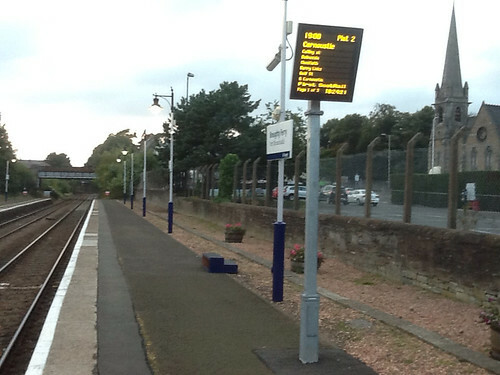 ScotRail have responded to appeals for help for their customers getting on and off trains stopping at Broughty Ferry station. They acknowledge that there is a big gap between the height of the platforms and their trains. This requires a big step up or down from passengers which some passengers may find difficult to negotiate. After an appeal from George Ferguson, the Chairperson of The Broughty Ferry Community Council, First ScotRail have provided two sets of wooden steps on each of the platforms. It is not clear who is responsible for moving these sets into place and how a passenger that needs help signals this to staff on the trains. I have written to First ScotRail to ask for clarification and to propose that their instructions to passengers about accessing the steps is publicised on the platforms and via announcements on the train. Blue Plaque Scheme for Broughty Ferry? Progress with Gray Street Pavements?